What does it mean to a city when its tallest building – a sign of progress – is removed? Slated for demolition, the Genesee Towers are under consideration to be replaced by a plaza – a sobering sign that the heyday of Flint is long past. “Ugly” or not, the Towers' demolition will serve as a visible atrophy – a vote of no hope and no optimism. The adjacent parking lot is an opportunity to test fit the symbolic loss of the building by erasing the building’s shadow. The zone which used to be shadow is erased with light and white. The trademark of the existing building – its singular open floor – is inverted as the only lit mass built – at its corresponding space on the new white shadow. Invented in 1911 in Michigan, white road paint is the primary means of inverting the shadow. An array of landscape strategies transform the planted areas into a white environment as well. 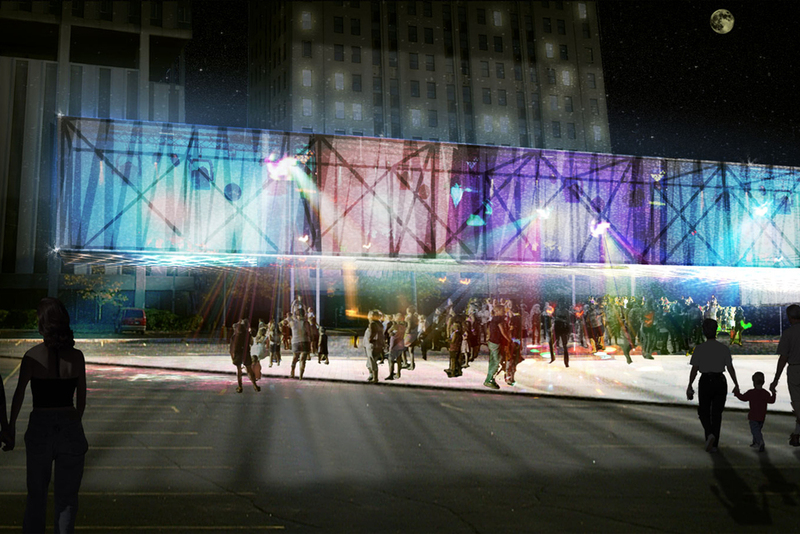 The lit mass, lifted above the parking surface, becomes a magnet for activities, performing simultaneously as shelter, lighting, and signage / advertisement. The white shadow demarcates a space for myriad events, but also serves as a reflection on the potential loss of the Towers. If the building is saved, the shadow becomes a marker of this moment of crisis. If it is demolished, the shadow becomes a temporary trace of the past. Either way, as time passes, the white shadow will wear away.